What Are Common Cold Symptoms and Signs? What Specialists Treat a Cold? What Is the Incubation Period for a Cold? When Should Someone Seek Medical Care for a Cold? How Do Health Care Professionals Diagnose a Cold? What Are Home Remedies for a Cold? What Are Treatment Options for a Cold? Are There Alternative Treatments for Colds? Is It Possible to Prevent a Cold? What Is the Prognosis of a Cold? A common cold is defined as an upper respiratory infection caused by a virus that usually affects the nose but may also affect the throat, sinuses, eustachian tubes, trachea, larynx, and bronchial tubes -- but not the lungs. Statistically, the cold is the most commonly occurring illness in the entire world. The common cold is a self-limiting illness caused by any one of more than 250 viruses. However, the most common causes of colds are rhinoviruses. Colds may also be termed coryza, nasopharyngitis, rhinopharyngitis, and sniffles. Everyone is susceptible to colds. The common cold produces mild symptoms (see below) usually lasting only five to 10 days, although some symptoms may last for up to three weeks. In contrast, the "flu" (influenza), which is caused by a different class of virus, can cause severe symptoms but initially may mimic a cold. Although colds have been with humans likely for eons, the first common cold virus was identified in 1956 in England, so the history of the cause of colds is relatively recent. Of the viruses that cause a cold, the most commonly occurring subtype is a group that lives in the nasal passages known as the "rhinovirus." Other less common cold viruses include coronavirus, adenovirus, and respiratory syncytial virus (RSV). Cold viruses may spread through the air and can be transmitted from airborne droplets expelled when someone with a cold coughs or sneezes. Close association with an infected person with a cold is the major risk factor. The primary means of spreading a cold is through hand-to-face or -mouth contact or from objects that have been touched by someone with a cold, or by touching items where droplets produced by coughs or sneezes have recently landed and then touching the face or mouth. The typical transmission occurs when a cold sufferer rubs his or her nose and then, shortly thereafter, touches or shakes hands with someone who, in turn, touches his or her own nose, mouth, or eyes. Virus transmission also often occurs via frequently shared or touched objects such as doorknobs and other hard surfaces, handrails, grocery carts, telephones, and computer keyboards. Most common colds require no medical treatment, however, primary care physicians, pediatricians, urgent care or emergency-medicine doctors often see patients with cold symptoms. Occasionally, allergists and, for pregnant women, obstetrician/gynecologists (OB/GYN) doctors may be consulted. The incubation period varies for a cold (time from exposure to virus to development of symptoms) and depends on the viral genus and strain but most range from about one to three days; for example, rhinovirus infections can have a very short incubation period of eight to 10 hours. When symptoms first develop, a person is very contagious, but after about six to seven days of symptoms that gradually decrease, most individuals are no longer contagious. Some colds last about two weeks, and some colds are contagious during the latter part of the incubation period before symptoms develop. For mild-to-moderate cold symptoms, individuals usually do not need to see a doctor. Almost everything a doctor can prescribe to relieve symptoms can be purchased without a prescription. For more severe cold symptoms or a prolonged duration of symptoms and/or signs, people should visit their doctor. An office visit will usually suffice, but if the person is extremely ill and seems to be getting worse, go to the emergency department. Symptoms and a physical examination are all the doctor needs to diagnose the common cold. An initial diagnosis often is made from symptoms alone. Usually, no blood tests or X-rays are necessary. During the physical examination, the doctor will pay careful attention to the head, neck, and chest. The doctor will examine the eyes, ears, throat, and chest to help determine if a bacterial source is causing the illness. Other tests may be done to differentiate a cold from other problems such as the flu, lupus, or pneumonia, for example. If a cold occurs during pregnancy, women should check with their OB/GYN doctors before they attempt self-care at home that involves any over-the-counter (OTC) medications. To date, no specific cure has been found for the group of viruses that cause the common cold. Antibiotics kill bacteria, not viruses, and are of no use in treating a cold. It seems unlikely a single antiviral medication will be discovered in the near future that can target the over 200 different cold viruses. That is true in part because the viruses genetically change (mutate) each season just enough to prevent the development of a specific treatment for that virus. Congestion: Drink plenty of fluids to help break up congestion and help keep mucus from becoming too thick. Drinking water will prevent dehydration and keep the throat moist. Some clinicians recommend people with colds drink at least eight to 10 (8-ounce) cups of water daily. Fluids might include water, sports drinks, herbal teas, fruit drinks, ginger ale, and soups. Cola, coffee, and other drinks with caffeine often work to increase urine output when the goal is to increase fluids in the body system; consequently, such fluids may be counterproductive. Put a pot or teakettle on a trivet on a table and drape a towel over the head and around the steam. A humidifier can increase humidity in a room and is useful to use during the winter when heating dries out the air and a person's mucus membranes. Fever and pain: Medications such as acetaminophen (Tylenol), ibuprofen (Advil, Motrin), or naproxen (Aleve) or other anti-inflammatory medications often help decrease fever, reduce sore throat pain, and relieve body aches. High fever usually is not associated with the common cold and may be indicative of "the flu" -- a more severe illness caused by an influenza virus. Report to your doctor any temperature greater than 102 F/38.8 C.
Never give a child aspirin or medications containing aspirin. In children younger than 12 years, aspirin has been associated with Reye's syndrome, a potentially fatal liver disorder. Suppressants: These act by blocking your cough reflex. As a general rule, use a suppressant for a dry, hacking cough. The agent usually found in over-the-counter cough suppressants is dextromethorphan (Benylin, Pertussin CS or DM, Robitussin Maximum Strength, Vicks 44 Cough Relief). Expectorants: A cough associated with excessive mucus production, or phlegm, warrants use of an expectorant. Guaifenesin (Mucinex, Organidin) is the most common active ingredient in over-the-counter expectorants (such as Anti-Tuss, Fenesin, Robitussin, Sinumist-SR, Mucinex). It is also used for nasal decongestion (see below). Lozenges and topical sprays can provide relief from sore throat pain. In particular, lozenges containing zinc may relieve many cold symptoms better than other types of throat lozenges. The benefits of zinc are not proven, however, and it can cause stomach upset. It also has been linked to loss of the sense of smell. Lozenges are not recommended for young children as they can be a choking hazard. A warm saltwater gargle can relieve a scratchy throat. Oral medications come in either pill or liquid form and act by shrinking engorged blood vessels in the nasal and sinus passages. They work well because the medication is distributed in the bloodstream. Oral decongestants often are associated with stimulant side effects such as increased heart rate, increased blood pressure, and insomnia. A commonly used over-the-counter oral decongestant is pseudoephedrine (Actifed, Sudafed, Triaminic), but people with certain health conditions such as Parkinson's disease, high blood pressure, or prostate disease should avoid its use. Nasal spray decongestants act similarly to oral decongestants but have the advantage of acting only in the area applied, usually without the stimulant side effects. The most common active ingredient in nasal sprays is oxymetazoline (Afrin, Dristan nasal spray, Neo-Synephrine, Vicks Sinex). A side effect of excessive use of nasal decongestants is dependency (rhinitis medicamentosa). Additionally, a "rebound" effect may occur in which nasal symptoms recur after a person abruptly stops the medication. Use nasal decongestants no longer than the package instructions indicate -- usually three days. An expectorant, guaifenesin, is used to thin out bronchial secretions, including mucus. This allows the patient to more easily clear their airways that may become blocked with secretions and mucus thus making blowing the nose more effective in clearing secretions. It also functions as a cough suppressant. Antihistamines such as diphenhydramine (Benadryl) can help relieve itching. Many people may see their doctor because they think antibiotics can treat a cold. Antibiotics may kill bacteria but have no effect on viruses that usually cause colds. Don't expect the doctor to prescribe an antibiotic for a cold, even if one is requested. Antibiotics may not prevent bacterial infections developing from a cold, such as sinusitis or ear infections, even if taken "just in case" and may lead to diarrhea or the development of more serious problems such as infection with Clostridium difficile or allow some organisms to become resistant to the antibiotics. Alternative treatments claim to either prevent colds or reduce the severity and length of time of symptoms. Some of the major alternative treatments include zinc compounds, vitamin C, and Echinacea supplements. Although there are some publications on these compounds, many clinicians consider the results inconclusive. Others suggest if the compounds are not used to excess, they may be helpful. Studies in 2012 suggested zinc may reduce symptoms by about one to two days but may produce a metallic taste or cause hearing difficulties. Over-the-counter medications may help reduce symptoms (throat lozenges, menthol), and nasal irrigation or eye medications may help reduce nasal congestion and/or inflammation. Some doctors suggest that the side effects are not worth the one to two days of reduced or absent symptoms. Check with your physician before using these treatments. If diagnosed with a common cold and the symptoms are improving after several days, no immediate follow-up is needed. If cold symptoms are not improving after five to 10 days or if they are worsening, call the doctor. People can exercise normally, especially if they just have a "cold" with no chest congestion and otherwise feel normal. Get plenty of rest. The body's natural immune defenses can battle and defeat the common cold virus. Resting at home or in a low-stress environment will help keep the immune system strong. Neither rest nor reasonable exercise will shorten the length of the cold. Avoid touching the nose, mouth, and eyes. Do not share utensils or towels with anyone. Wear gloves while in public places, such as public transportation during the winter cold season. There is no vaccine to prevent colds. There are two major reasons vaccines are not being sought for colds. 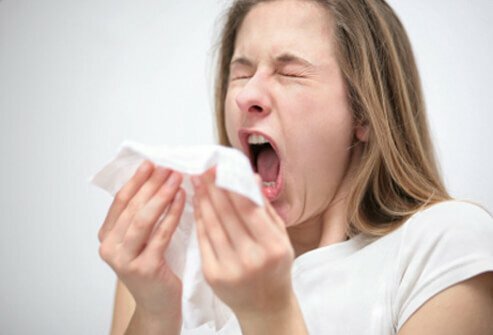 First, almost every person who gets a cold recovers without any complications, and second, with over 250 viral types, producing an effective vaccine against most or all viral types is nearly impossible with current techniques. The common cold usually will go away in usually about five to 10 days although some symptoms may last as long as three weeks in some individuals. Americans get over 1 billion colds per year and rarely report any complications. In general, pregnant women and their fetus usually have no complications if the mother develops a cold. Pregnant females should consult their OB/GYN doctor before using any medical treatments. Among the elderly and other groups of people with serious medical conditions, a cold may sometimes lead to a serious problem. Those people should see a doctor early during the course of a cold as a preventive measure. Washing your hands for at least 20 seconds can help protect you from getting sick. Washing your hands frequently helps prevent the spread of infection. Use plain soap and water, making sure to pay attention to spaces between fingers, and under the fingernails. Rinse and dry with a clean towel. Teach your children to wash their hands properly. If soap and water is unavailable, alcohol-based hand sanitizers are an alternative. United States. Centers for Disease Control and Prevention. "Common Colds: Protect Yourself and Others." Feb. 8, 2016. <http://www.cdc.gov/features/rhinoviruses/ >. Patricia Solo-Josephson, MD. Colds. June 2017. The Nemours Foundation. 12 November 2018 . Sexton, MD, Daniel J and Micah T McClain, MD, PhD. Patient education: The common cold in adults (Beyond the Basics). 25 January 2018. 12 November 2018 . What symptoms did you experience with your cold? What home remedy did you use on your colds?